Patrick is particularly skilled at dealing with difficult people and situations. He is able to build trust with all mediation participants in an effective and timely manner. He is even-handed in his approach to participants and never plays favorites. He comes to a mediation thoroughly prepared, and participants appreciate his understanding of the facts, the law, and each party’s perspective. Through hard work, determination, and patience, he settles over 90% of his mediations. Settling significant disputes is a process, and Patrick helps parties develop a methodology and procedure that helps assure success. Patrick is a fully involved mediator who helps the parties focus on the important issues in a case and on the facts that impact those issues. He sees his role as that of a “reality therapist” whose job it is to provide insights to participants and to help them focus on the risks of litigation. He has the unique ability to deliver “bad news” in a manner that keeps the parties engaged. Complex cases are co-mediated with his partner and son Devon Coughlan. As co-mediators, they move the cases more efficiently and effectively. They work with the parties to identify crucial issues, missing information, and impediments to settlement. They help manage information sharing and discovery to expedite mediation and save the clients time and money. 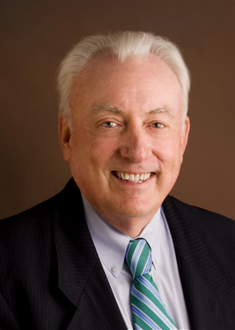 Patrick Coughlan is a graduate of Duke University where he was on the Dean’s List, Chairman of the Court of Appeals, Vice Present of the Senior Class, and played two varsity sports. He has a JD degree from Duke Law School where held had an academic scholarship throughout law school, and was on the Moot Court Team. Patrick served in the USAF as a Judge Advocate and was a Command Prosecutor for the Third Air Force in England during his military career. He has extensive experience in business and has owned and managed a number of million dollar companies. Patrick feels that his business experience makes him a more effective mediator because he understands the clients’ point of view. He is married to Joyce Miskuf Coughlan, and they have six children, two of whom are lawyers. Patrick’s record of resolving cases with challenging issues and emotionally invested participants is unsurpassed. He often mediates cases where other mediators failed. The very disputes that attorneys believe cannot settle are the ones that they routinely refer to Pat. Many of Pat’s environmental matters involve public, government, and corporations. Pat has a unique skill in managing the emotional reaction of participants where the environment is concerned. His cases often involve toxic waste, oil refineries, dump sites, and clean-up and mitigation issues. School of Law, Duke University, J.D. Academic Scholarship throughout law school. Moot Court. Duke University,Undergraduate, B.A. Dean’s List; Who’s Who in American Colleges and Universities; Chairman, Court of Appeals; Vice President of Senior Class; Housemaster; Arnold Air Society; Distinguished Military Graduate; Varsity Lacrosse; Varsity Swimming. Pingry School, High School, Elizabeth, N.J. Throughout his mediation career, Mr Coughlan has been a featured speaker at bar meetings, seminars, corporations, and public meetings throughout the country. Patrick Coughlan believes in making his community a better place and has served on the boards of numerous non-profit organizations as both an officer and board member. He has been recognized for his work on numerous occasions and is listed in numerous biographical works such as Who’s Who in The World. “I want to thank you for the effort you put into settling the…cases. I heard many positive compliments over the course of the day from insurance executives in the room, on the elevator and in the meetings. I personally felt you really made the difference. Thanks again.” R.G. “Pat, Thank you for your very helpful input in these past few weeks in the…case. You were instrumental in getting the case resolved, when it looked like we were foundering…I greatly appreciate how you made things happen so that we could get this done.” W.D. “I had a client who was not very enthusiastic about or open to mediation…changed her mind…because of Pat’s style.” C.R. “…thank you for your skillful intervention and in particular for taking the time to make follow-up calls to move this case to a final settlement. The proof is in the pudding and the value of your contribution, Pat, was evident in the outcome.” T.P. “Dear Pat, Thank you very much for your experienced and professional approach to yesterday’s mediation…If I have any further matters which might be appropriate for mediation, you can be certain that I will be calling you again.” M.M. “…pleasure meeting and working with you on…matter. I appreciate all of your good efforts in knocking both sides around to a point that resulted in successful settlement of the case. Pat, I also appreciate the personable manner in which you conducted the mediation.” R.C.